Repairs mis-cut drywall eliminating oversized receptacle box holes. Self-adhesive, superior strength, easy to use. Shut off power to receptacle box before repairing! 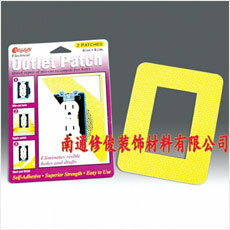 peel off paper backing and apply self-adhesive outlet patch directly to wall, centering it over receptacle box. cover entire patch with drywall compound, feather edges, let dry, and sand. Repeat as needed. finish to match surrounding wall surface. Warning! Failure to shut off power in area of work may result in electric shock, fire, and/or serious personal injury.